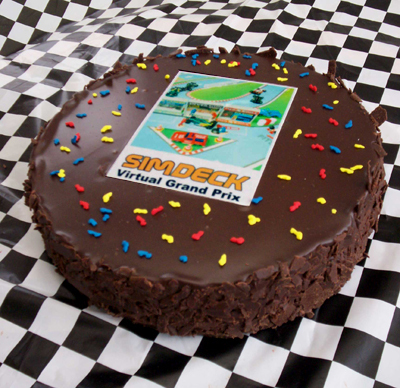 The SimDeck Birthday cakes are exclusive to SimDeck Formula Simulators and add that unique and special aspect to the SimDeck Simulation Birthday. Having a good Pit Crew is very important if you want to win your race and eat your cake. race car cakes. 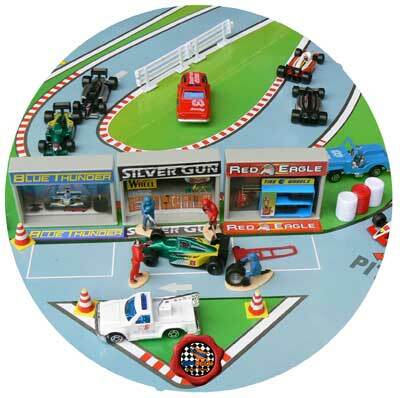 Each design highlights the many varied aspects of Formula open wheel race car motorsports. Our range starts off with over 20 exciting designs providing a wide choice. To select the design for your birthday cake just quote the cake number. If the design is out of stock we can produce new stock in about 4 days, so plan ahead and we will have the design of your choice. The cakes are either a chocolate Mud Cake or Carrot Cake manufactured for us by an A Grade commercial cake kitchen so quality is always assured. Some cake top race images are designed to have additional custom writing, for example the child’s name etc where we can add custom details like birthday name, age etc. All cakes are fresh and overall size is 9″ diameter and provides about 12 slices. Some cakes are designed to have additional custom writing, for example the child’s name etc. Refer to the listing for the design of the 20 current cake top designs. If you would like us to email the cake top brochure to you send an email to sales@simdeck.com with the Subject Line – SimDeck Cake Request. Cakes are available for single purchase or as part of the SimDeck Birthday Simulator Experience. Please place your order 7 days before you require it. If you wish to purchase a cake only, payment is required at time of collection. If you are selecting a cake(s) as part of the SimDeck Simulator Experience the cost for one cake is included as part of the Birthday Experience. Miniature Single Person Chocolate cake with 50mm dia. Printed Race Scene. Chocolate Cake infused with coffee syrup, covered with smooth silky white chocolate ganche and decorated with a miniature high resolution printed race scene. Per cake – $4.50. Minimum Order for SimDeck Event – 6 pieces. Per cake – $4.50. Minimum Order for your own event – 12 pieces. Name writing $7.90 (GST Incl). Only on the 9″ cake. This is the larger 8″ print size. 8" Print size has an additional premium price due to the high print cost. Various print designs available. Please refer to the SimDeck Simulators Birthday pack information we will email to you for additional food and drink options available for your function. We have standard Packages available according to the number of birthday guests. Alternatively follow this link to the current range of SimDeck Cake tops designs. Please note all prices subject to change without further notice.